When I think of summer, community and local, I am instantly transported to any farmer's market in the world. And that's why I love this #locallove post: finally, it's applicable to those outside of the GVRD. I have a funny relationship with food. I'm recovering from an eating disorder, I recently left the vegetarian lifestyle but I'm still really uncomfortable by our food systems and feel tremendous guilt over the foods we eat. So shopping at a big chain supermarket isn't exactly the most fun experience for me, even one like Save On Foods which works really hard at branding themselves as some local, community market thing. This isn't exactly a healthy feeling for me to have, and could easily trigger some old E.D. habits (for those not aware of eating disorder language, E.D. stands for eating disorder). But the grounds of a farmer's market are filled with authentic community feels. You can talk and form real relationships with the people who prepare/grow/raise the food you plan to put in your body. There is often various forms of entertainment at the markets and the grounds are usually always filled with laughter of children or the happy spirits of your neighbors. 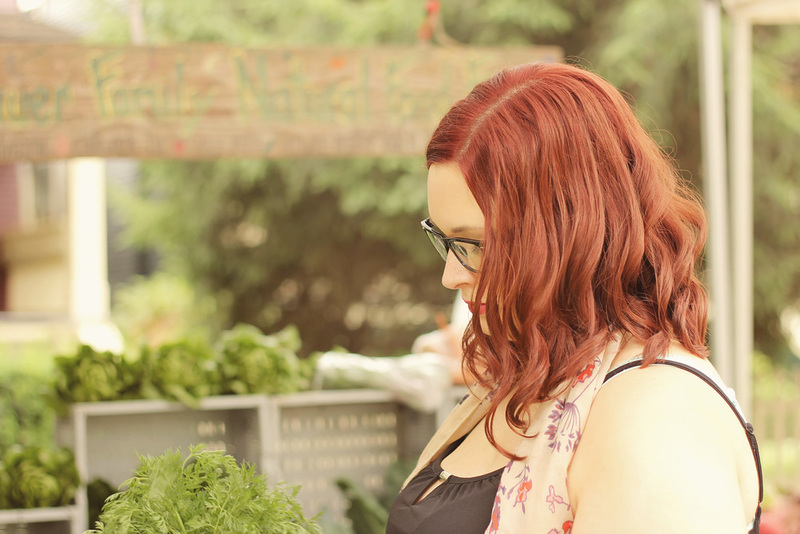 Being at a market is like an awakening to what community looks and feels like. Additionally, coming home with a basket filled of good for me food, where I know the animals were treated well and the berries were given the best possible care, really ignites a fire inside me. The act of purchasing and preparing these foods grounds me. It's almost as if I never had an eating disorder at all. And bringing that food into my home is like bringing in a part of my community. I truly believe all these experiences are even more important when you actually have other people you are cooking for. The act of sharing a meal is so important and what you nourish yourself with plays a major role in your life. Why not bring the best to the plate? Why not infuse your dinners with community and wholesomeness? Why not put out a snack time spread of local, organic goodness? The experience of a farmer's market shop goes beyond the hour or so you might actually spend shopping. It infuses itself into your life and brings you nourishment for the days to come. So please, if you haven't done so already, Google your city + farmer's market and bring community into your food.